They're quite a nuisance, aren't they? If you suffer from bothersome and unattractive leg or facial veins, port wine stains, unsightly scars or even rosacea, I have some terrific news for you. 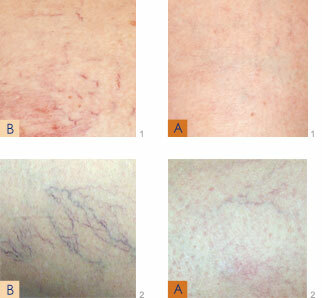 I can treat these vascular conditions with more dramatic results than ever before! Whether you have blue, red or purple veins that are the results of too much exposure to the sun, genetics or aging, I can now virtually eliminate them. The treatment causes only minimal discomfort. You will be able to resume normal activities immediately and any bruising, redness, or swelling quickly resolves over time.